When I was a child, very occasionally, my father would get out an old book that told your fortune. It was called The White Magic Book - a misleading title as it was an oracle in book form rather than a grimoire of spells. It promised to answer your questions, and though it seemed you were randomly finding the answers within in its yellowed and musty pages, it was usually surprisingly accurate. The hardback copy my father owned was falling to bits even when I was young and I suspect it may not have stood the test of time since. I searched for it among my parents’ belongings after they passed away, but did not find it and have always had a yearning for another like it. Imagine yourself in an old dusty attic room. It is filled with relics from a forgotten time and as you look around you notice a worn trunk in the corner. You kneel before it and slowly lift its creaking lid. Searching through the contents, you find a large leather-bound book. Unable to determine the title, you carefully lift it up, blowing away the cobwebs and dust, till the words ‘The Book of Destiny’ appear. With trepidation you open the book… You tentatively turn the pages, yellowed with age. You realise that this isn’t any ordinary book, for it speaks to you of ancient secrets, words of the wise, and with a gasp you quickly shut it. For a moment you close your eyes, then taking a deep breath you open the book again. It falls to a page that appears to have been written especially for you. In that moment, the message tells you all you need to know. The Book of Destiny is actually a bit different to The White Magic Book – and simpler to use too. You just think of a question and then open the book. Whatever pages it falls open at will give you clues and insights to provide the answer. What is really original about it is that familiar old sayings are used as titles for each message. For example, the very first one is ‘Crystal Clear’, and suggests that you are asking for clarity because “Your judgements are being clouded at the moment by your expectations and fears, and those of others.” It suggests gazing into a crystal ball for all to become clear. There are hundreds of sayings in the book. Each comes with an explanation of the meaning, a picture and some history or facts about the item depicted. You can see the image of the crystal ball to the right. I really love this original twist on fortune telling. 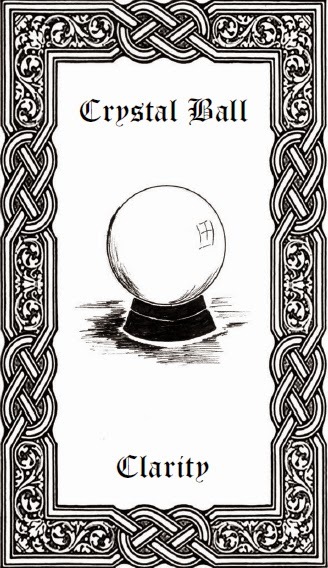 It seems to tie into traditional folk wisdom and combine the best aspects of using pictures and words for divination and insight. What I would say is that it is ideal to own this book in paper format. My review copy was a pdf. I used a random number generator for page selection, but it would feel so much nicer to open some real paper pages. Using The Book of Destiny has also prompted me to venture up into the attic for one more search for my father’s book. Maybe, just maybe, that tattered old copy of The White Magic Book is still hidden in a worn trunk in a dark, cobweb-strewn corner, ready to reveal its secrets once more. I have discovered that I could order a second-hand copy of The White Magic Book via Amazon, but it wouldn’t be the same. If I was buying a new book, I think I would go for The Book of Destiny.